It doesn’t seem that long ago when a group of Irvine residents – some of them friends, some of them yet to become friends – gathered in a meeting room at the Irvine Marriott to learn about National Assistance League, a volunteer service organization, and how an Irvine-based chapter could benefit our community. We began by working closely with the Irvine Unified School District to estimate how many elementary school students might benefit from Operation School Bell®, a free clothing service for children from low/extremely low income families. 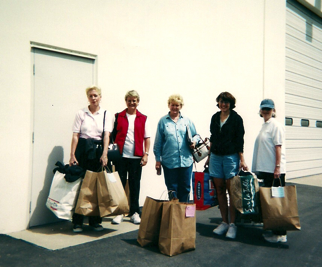 Operation School Bell was – and still is – National Assistance League’s signature philanthropy, a program conducted by all of the organization’s chapters nationwide. That first year, we clothed 40 children. To raise funds to support Operation School Bell and other proposed philanthropic programs, we began what became a holiday tradition, A Festival of Trees and Treasures. The event, a festive holiday brunch, featured a silent auction, performances by choral groups from Irvine high schools, and the auction of 8-foot-tall Christmas trees decorated by chapter members. We were thrilled and delighted to have realized nearly $20,000 from our first holiday brunch. 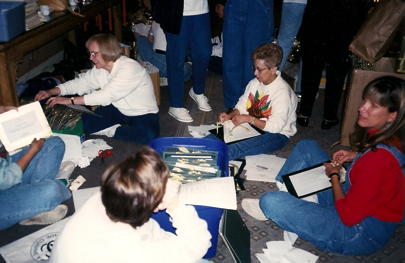 Of course, none of our accomplishments would have been possible without the hard work of our members. As our three-year probationary period was coming to a close, we proudly boasted 68 members, a number more than sufficient to become a chapter. 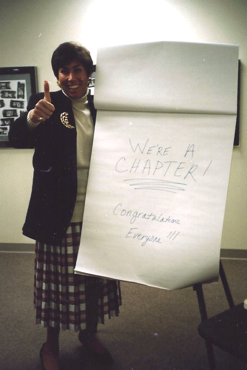 And in June 1993 we were welcomed as the 84th chapter of National Assistance League. Assistance League of Irvine was well on its way to meeting its mission: to provide programs and services that will enrich and improve the quality of life in our community.